Julia Child, My LIfe in France. Julia Child was born in Pasadena, California. She was graduated from Smith College and worked for the OSS during World War II in Ceylon and China, where she met Paul Child. After they married they lived in Paris, where she studied at the Cordon Bleu and taught cooking with Simone Beck and Louisette Bertholle, with whom she wrote the first volume of Mastering the Art of French Cooking (1961). In 1963, Boston's WGBH launched The French Chef television series, which made her a national celebrity, earning her the Peabody Award in 1965 and an Emmy in 1966. Several public television shows and numerous cookbooks followed. Julia Child has a Legacy Library. Legacy libraries are the personal libraries of famous readers, entered by LibraryThing members from the Legacy Libraries group. 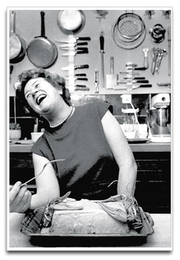 » Julia Child's legacy profile. Julia Child is currently considered a "single author." If one or more works are by a distinct, homonymous authors, go ahead and split the author. Julia Child is composed of 4 names. You can examine and separate out names.